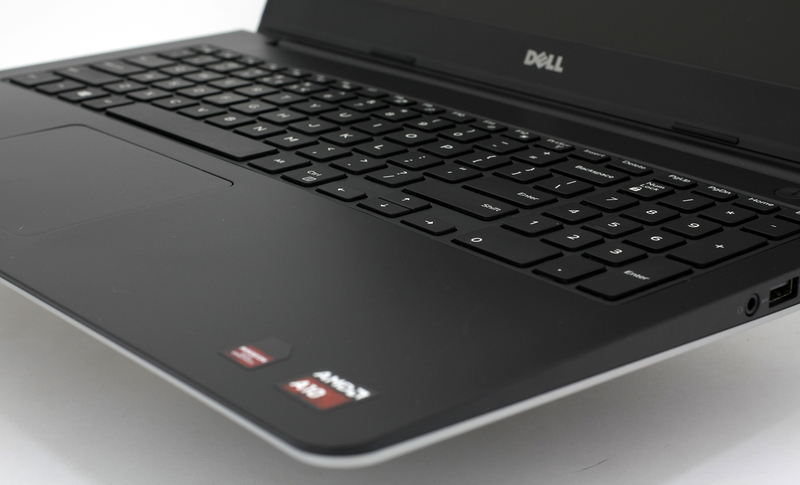 We dive again into the realms of budget notebooks, but this time we are going to review an absolute powerhouse, given the price point of the Dell Inspiron 5545. This standard 15.6-inch notebook features one of AMD’s A10 series mobile APUs and R7 M265 graphics card that work in a so-called asymmetrical CrossFire that should improve graphics performance a lot. We will be sure to check that out in the following review as this is one of the main reasons we picked up this notebook for an in-depth review. Other than that, we are presented with a typical budget Inspiron notebook with glossy HD screen and overall attractive design. So we are going to compare the machine to the other Intel alternatives on the market and see if it can fit the profile of a “light gaming” notebook for half the price. Also, as part of an AMD promotion, you can claim one free game title of your choice which are listed in the retail package section. The notebook boasts a rather attractive and interesting design signature that we are used to seeing in the upper-mid-range class. 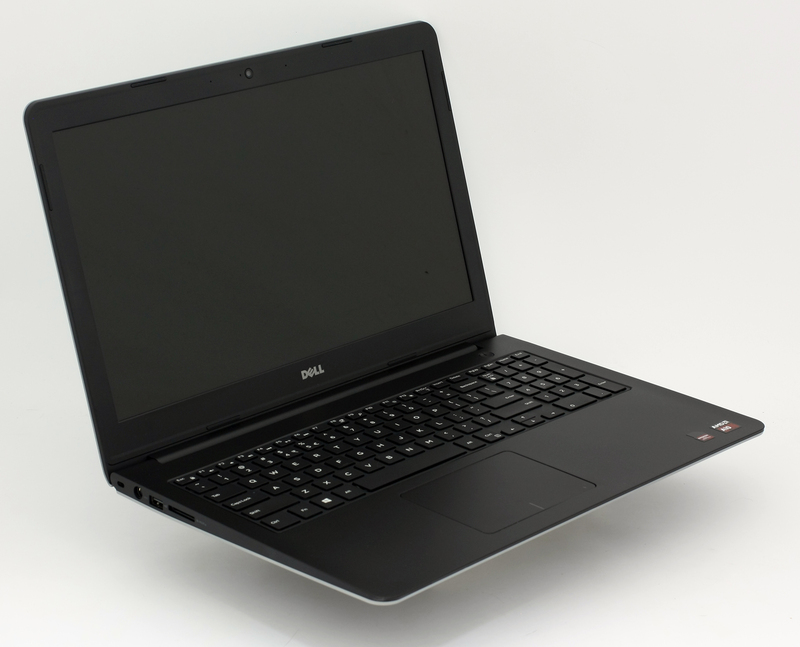 It strongly resembles the Dell Inspiron 5758 and 5749 notebooks but in a smaller shell. 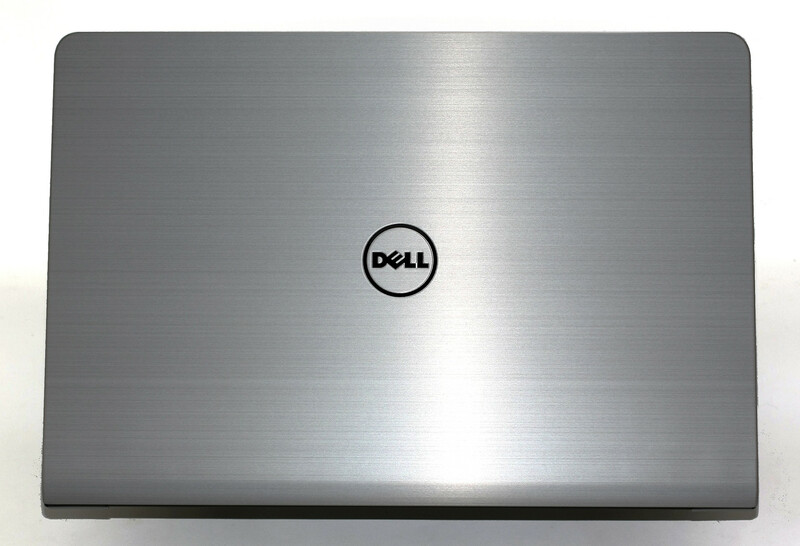 The lid is completely covered in brushed aluminum with Dell’s logo in the middle giving the impression of a higher class device, yet fingerprints are easily attracted but not as visible. It also appears to be quite sturdy for a budget notebook that is, because the lid doesn’t bend as much under heavy pressure. This makes it suitable for frequent travelers and you can rest assured that relatively heavy objects will not damage the chassis or the LCD panel on the other side. Speaking of which, the display on the other side of the lid is 15.6-inch with the built-in webcam on top of it while the bezels are somewhat thin or at least not as distracting. As for the bottom part of the notebook – it doesn’t offer anything out of the ordinary just a few screws for opening the notebook and a big vent that can be used for an external cooling pad. There’s one thing worth mentioning, though. The silicone “legs” appear to be a bit “slippery” and do not deliver the much-needed sturdiness and, as a result, the notebook can be moved easily across the surface. Going around the sides of the notebook we find the DC charging port, SD card reader, and one USB 2.0 located on the left while the right side accommodates the LAN port, two USB 3.0, 3.5 mm audio jack and full-sized HDMI port. This brings us to our next question. Why has Dell moved the most used ports on the right? This often results in inconvenience for the user when used with a mouse. Cables often get in the way when the workspace is insufficient. However, the machine offers relatively thin chassis with just 21.8 mm (0.9″) profile. Opening the lid reveals the interior that uses an interesting mixture of matte soft-touch plastic and hard plastic. Something in-between. It definitely looks nice and feels nice, but it’s prone to smudges, yet they are again barely visible – just like the aluminum cover on the lid. Anyway, the first thing that comes to mind when looking at the keyboard is that the keys are too small. Interestingly, Dell has put a tad smaller buttons compared to other 15-inch notebooks out there, but still provide long tactile feedback and will require some time for adjusting. Finally, the touchpad. It consists of a big plastic plate, that’s quite accurate and gestures are well recognized, but the same cannot be said about the left and right button. The better part of the touchpad registers right (or no a click at all), so you have to really click the bottom left corner. Quite uncomfortable to be honest. Dell Inspiron 5545 is a good-looking 15-inch budget notebook with nice finishing touch (the aluminum lid) that’s rarely seen in the budget and mid-range class notebooks. The better part of the notebook attracts dust and smudges but are rarely visible under normal circumstances. Also, the chassis is sturdy, rigid without any inconsistencies like cracks and holes, but we found several drawbacks that are worth considering. 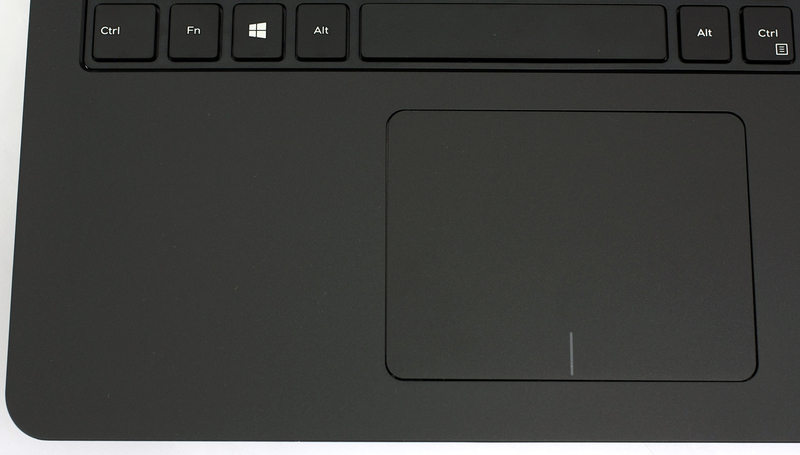 We are referring to the small keys of the keyboard, uncomfortable touchpad and the silicone legs at the bottom that fail to keep the notebook in one place and often slides on the surface. 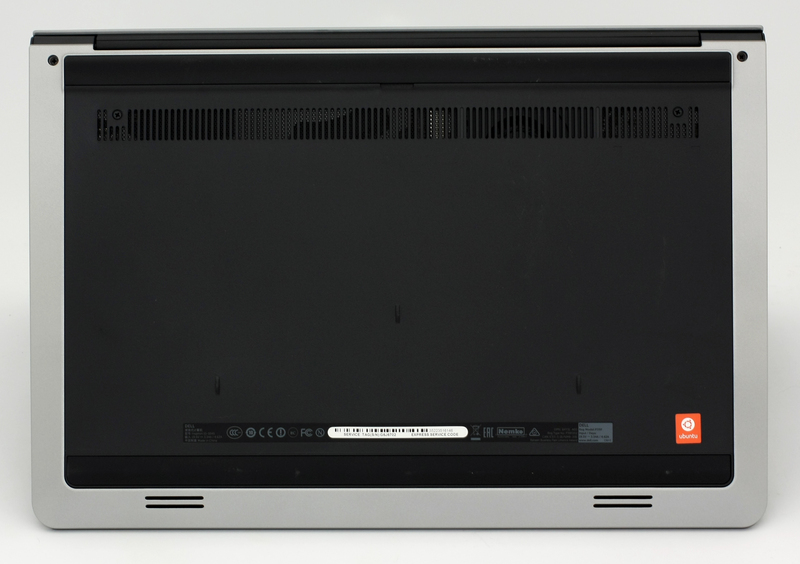 Dell Inspiron 5545’s display adopts a WXGA HD TN panel with glossy finish and model number KYK75-156BGE. The diagonal is 15.6″, 16:9 aspect ratio, 1366 x 768 resolution and pixel pitch of 0.253 x 0.253 mm leading to a pixel density of only 100 ppi. The screen can be considered “Retina” when viewed from a distance equal or greater than 86 cm. As usual the TN panel doesn’t offer the much-needed viewing angles under 45 degrees. The maximum brightness of the display is only 206 cd/m2 with a maximum deviation of 12%. The average color temperature on the surface of the screen is about 6780K which is pretty close to the optimal one of 6500K(D65). No deviations here whatsoever. On the image below you can see that the yellow triangle represents the color space that the display covers and in our case – 56% of the sRGB and 48% of the Adobe RGB. This means that the image quality will not offer vivid and saturated colors. We used X-Rite i1Display Pro as a calibration tool. With the help of 24 commonly used colors, we checked the color accuracy of the panel. Colors that we used represent skin tone, grass, blue sky, orange and etc. 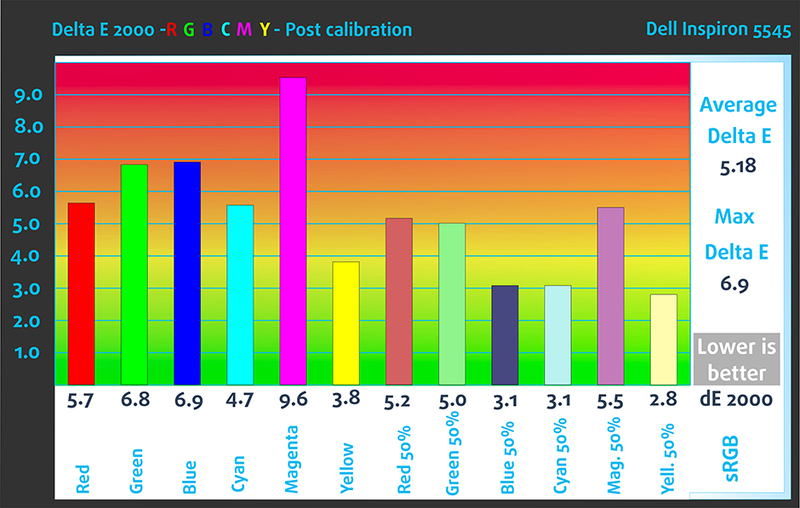 The average DeltaE 2000 is 1.38 after calibration. 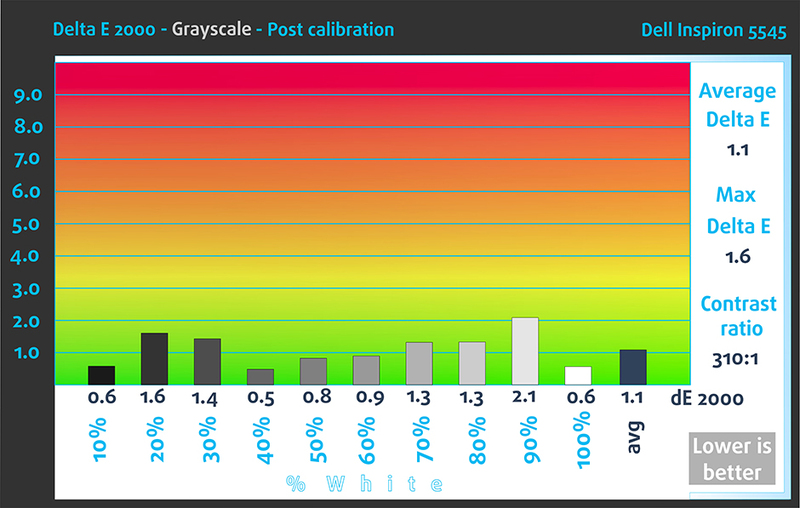 Lower score is desirable and deviations under 1.0 can be detected only with a lab equipment. Unfortunately, the machine’s display uses PWM across all brightness levels (except 100%) and the frequency of the emitted light is 1 kHz. Keep in mind that above 300 Hz the negative effect of the emitted light is gradually reduced. We are presented with a budget type of TN panel, which is expected given the price point, and despite its big drawbacks like poor color gamut coverage, bad viewing angles, low contrast and resolution, the display inherits some of the goodies a TN panel offers. The most notable one is the energy efficient nature of the TN matrices and accurate color reproduction after calibration. However, the PWM across all brightness levels should be considered by users with sensitive eyes. The notebook boasts the so-called Waves MaxxAudio technology that further improves the quality of sound offering various modes like gaming, watching a movie, listening to music etc. This particular model is offered in two variants that differ in battery capacity. The one we got features 3-cell 43Wh battery, while the other variant boasts a huge 4-cell 58Wh. Still, the 43Wh capacity should prove sufficient for prolonged usage although the 19W CPU and the discrete GPU will take a toll on battery life. We ran our usual tests – Wi-Fi browsing, video playback and gaming with the usual settings – power saver on, Wi-Fi turned on and screen brightness set to 120 cd/m2. We are not impressed with the battery life, despite the big capacity – 242 minutes (4 hours and 2 minutes). Even worse result here – 188 minutes (3 hours and 8 minutes). A10-7300 is one of the ultra-low voltage processors from AMD that features four cores clocked at 1.9 GHz and can go up to 3.2 GHz. This is quite a big boost range. The chip is based on the Kaveri architecture that was announced back in June 2014 but adopts revised CPU cores codenamed Steamroller. Furthermore, the manufacturing process is 28 nm SHP and falls behind the latest Intel CPUs that are now going down to 14 nm. The most notable feature of this processor is the Radeon R6 (Kaveri) integrated GPU. It can handle some of the latest gaming titles with medium and low-resolution settings due to the 533 MHz maximum clock and 384 shader units. The GPU also supports DirectX 11.2 and Mantle and can work in an asymmetric CrossFire configuration with a discrete GPU for improved graphic performance. The power consumption of the whole APU is rated at 19W, can be used for light gaming, office applications, browsing, multimedia, and can perform well with graphically intense applications like Adobe Photoshop. Fritz is a chess benchmark that tests the computing capabilities of the CPU with various chess moves. 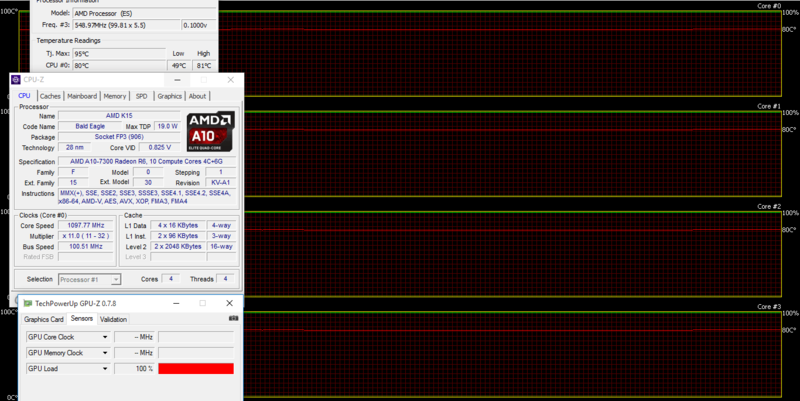 The AMD A10-7300 managed to get 3944 million moves per second. For comparison, one of the most powerful PCs, Deep(er) Blue, was able to squeeze out 200 million moves per second. In 1997 Deep(er) Blue even beat the famous Garry Kasparov with 3.5 to 2.5. AMD Radeon R7 M265 is a discrete graphics card used in mobile PCs. Its capabilities aren’t suitable for gaming, but for multimedia tasks and applications. It features a 4GB of dedicated memory (DDR3 SDRAM), 128-bit bus width and memory clock at 1800MHz or 2000MHz if needed. Shaders count at 384 units with 1040 million transistors in the GPU, speaking of which, it’s manufactured with 28nm process. The GPU is clocked at 825MHz with boost capabilities of 900MHz. Also, the GPU is part of the GCN architecture. Is gaming possible with this budget machine? You bet! It can even run GTA V in low resolution and minimum settings pretty decent, although the CPU doesn’t fall into the “minimum requirements” section. However, take a look at the other games that we ran with the given hardware. This test consists of two stages and can be considered as quite essential, because it tests the overall stability of the system and how the cooling system handles bigger loads and higher temperatures. It will also be interesting to see if the CPU and GPU share the heat especially when asymmetric CrossFire mode is enabled. We start off with 100% CPU load for at least an hour. Under normal usage, the silicon reaches 49 °C and after continues load the CPU went as high as 64 °C which can be considered as a great result. However, the boost frequency of 3.2 GHz was turned on only for a few minutes and the clock gradually went down to 1.8-1.9 GHz. 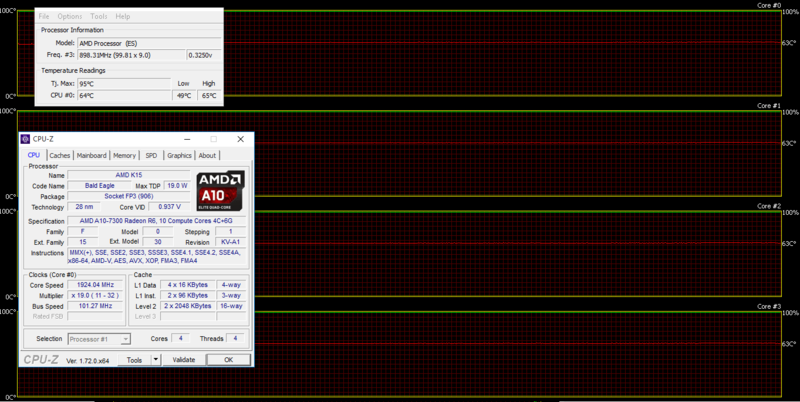 This can be considered as minor throttling since the base frequency is 1.9 GHz. The green line on the graph below represents the CPU load and the red line – the temperatures. After an hour, we’ve included the GPU stress test. Things heated up quickly as the CPU reached 81 °C, but, unfortunately, we couldn’t gather any information about the GPU. Furthermore, the CPU dived even deeper and the operating frequency was around 1.1-1.2 GHz and can be considered as major throttling this time. You can see the outer temperatures on the chassis after prolonged load and as expected the highest measured temperatures are near the back of the machine where the main exhaust vent is located (near the hinge). Unfortunately, the heat distributes down to the center of the keyboard and you can feel some heat when typing. Well, at least the area where palms rest doesn’t go beyond the comfortable temperature. 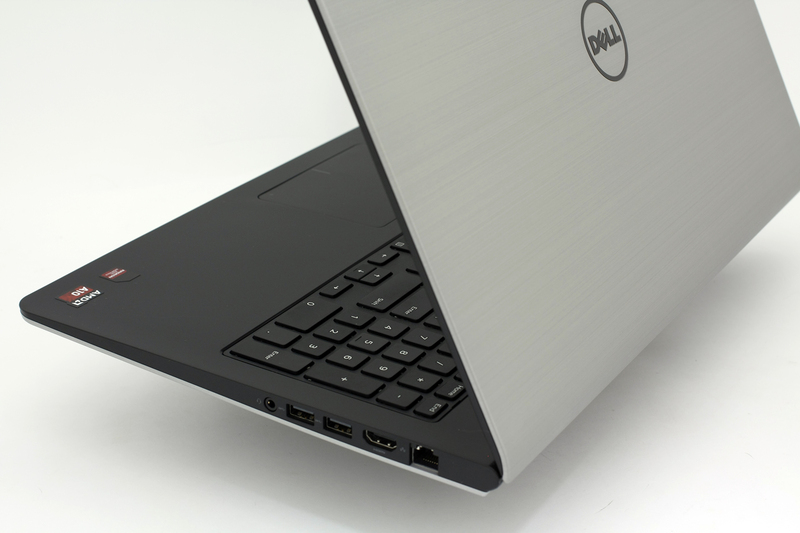 The Dell Inspiron 5545 is a true gem in its class in terms of performance. Not all notebooks under €500 can run GTA V with decent frame rates and this is mainly due to the asymmetric CrossFire configuration that the iGPU and the discrete GPU (both Radeon of course) offer. You can rely on both GPUs to handle graphically intense tasks, but the compute performance and the TDP (19W) are not par with the latest technology trends, though. Still, we cannot be too picky at this price range. Another notable feature of this notebook is the design. It really looks and feels good with solid build quality, but there’s more to be desired in this aspect to be honest. We are disappointed with the size of the keys, the touchpad performance and the silicon legs at the bottom, which failed to keep the notebook stable on the surface. There are too many inconsistencies that can’t be overlooked. The display isn’t anything special as well, but we can let it pass considering the price tag. As for the stability of the system and battery life – we are left with mixed feelings. While the outer chassis handles higher temperatures relatively well, the CPU throttles excessively under heavy load, but this is quite unlikely scenario under normal circumstances. Moreover, the battery life is somewhat disappointing regardless of the energy-efficient HD TN panel, big 43Wh battery and 19W SoC. It looks like the CPU could use some improving in the power consumption department, but we have to take into account that the processor has been released in June 2014. We will have to wait for the Carrizo generation APUs to see if it will right the wrongs of this one. I use this laptop with windows 10, playing dota 2 with high graphic its ok, farcry 3 ,gta 4 high setting too … But in my laptop just one graphic card thats R6 ..